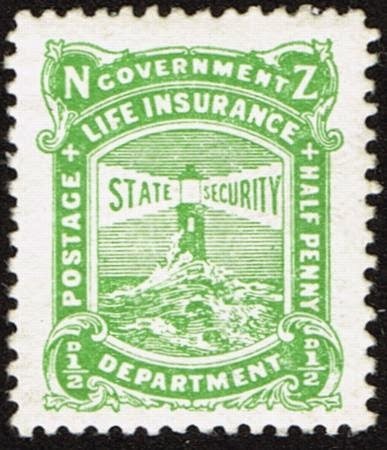 Virtual New Zealand Stamps: Government Life Insurance - Summary. 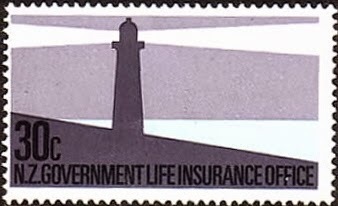 As part of the current building of many parts of this blog, this summary of the Lighthouse Life Insurance series has been moved from its page in the top bar to a normal post. This means it can be now be found via our labels in the sidebar or via the Index/Groups of Posts page. For my next project, I will be doing this job for Mary. Currently, she is doing a series on the stamps issued by the Government Life Insurance Department/Office. I have been asked to lay out a page of all the lighthouse issues, with links to and from each issue. At the same time, I will be adding forward and back navigation links so you can move between the various posts/issues. To ensure that these stamps were only used for their intended purpose, they had to have a very distinctive design. Since the symbol of the Insurance Department was a lighthouse, all Government Life Insurance Department stamp designs have featured lighthouses. So actually this was more like a personalised stamp, being printed and issued by the Post Office but only used by the Insurance Office. 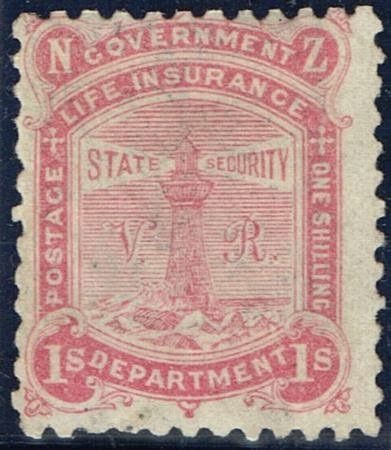 ﻿ For more detail see our post - 1891 Government Life Insurance (With VR). 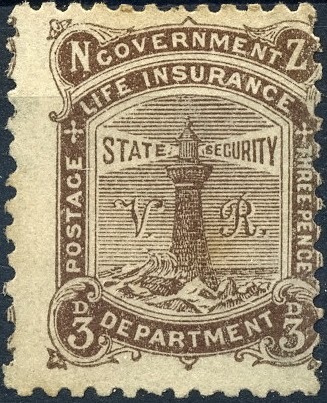 These are the first Government Life Insurance stamps featuring the lighthouse symbol. They are often known as the 'VR Lighthouses' because of the 'VR' in the background behind the tower. There were six values in the set, from half a pence going up to one shilling. ½d Purple - Lighthouse (with VR). 1d Blue - Lighthouse (with VR) 2d Chestnut - Lighthouse (with VR). 3d Brown - Lighthouse (with VR) 6d Green - Lighthouse (with VR). 1/- Rose - Lighthouse (with VR). 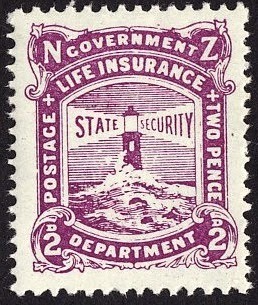 These two stamps are included in our post - 1913 Government Life Insurance (No VR). After Queen Victoria died there was no longer a need for the 'VR' which was first removed in 1905. 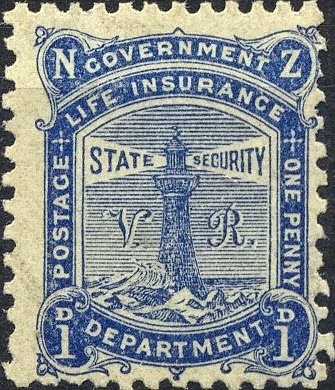 The 1905 2d Chestnut was followed in 1906 with the 1d Blue. They were used along with some of the older 'VR' stamps until they were withdrawn from sale in 1907. 1905 2d Chestnut (No VR). 1906 1d Blue (No VR). View our full post - 1913 Government Life Insurance (No VR). 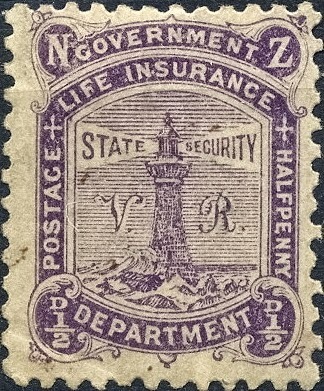 The Government Life Insurance Department began issuing their own stamps again in 1913. 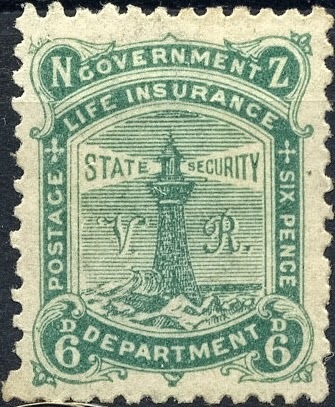 This new issue continued with the same design from 1905 with the lighthouse design but without the 'VR.' As Mary shows in her post, this issue has some new values added and colour changes made over the years. Here I have chosen to show you the simple version as seen in most simple catalogues. ½d Green (No VR). 1d red (No VR). 2d Purple (No VR). 3d yellow-brown (No VR). 6d Pink (No VR). 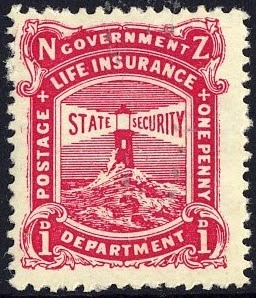 See our post - 1913 Government Life Insurance (No VR). 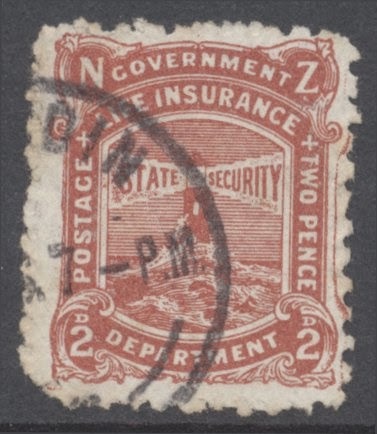 A new value was added in 1917. This was changed to a lighter colour 2 years later. 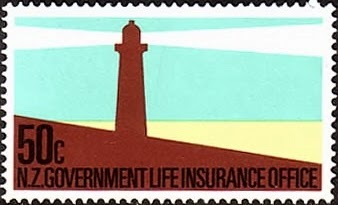 See our post - 1947 Government Life Insurance Lighthouses. 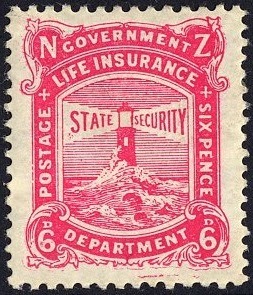 In 1947 there was a new issue of Lighthouse stamps. This time actual lighthouses were shown. In Mary's post, she will also show you photographs of each of these lighthouses. I believe this slight change in theme has made these stamps so popular over the years. 1d - Taiaroa Lighthouse. 2d - Cape Palliser Lighthouse. 3d - Eddystone Lighthouse. 4d - Stephens Island Lighthouse. 1/- Cape Brett Lighthouse. 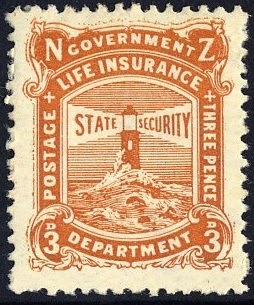 Included in our post - 1947 Government Life Insurance Lighthouses. In 1963 a new value was added to the 1947 issue. Notice two things about this stamp. First, the stamp features a cleaner and more modern appearance. Secondly, the name has been changed from NZ Government Life Insurance Department to Life Insurance Office. In 1967 New Zealand changed to decimal currency. As Government Life was planned a special issue for their centenary in 1969 they didn't want to design a new issue for only 2 years so the older 1947/63 stamps were overprinted with decimal values. 1969 Lighthouses - Centenary of Government Life. 1969 was the centenary of the founding of the Government Life Insurance Office and a new series of stamps was issued to mark this occasion. 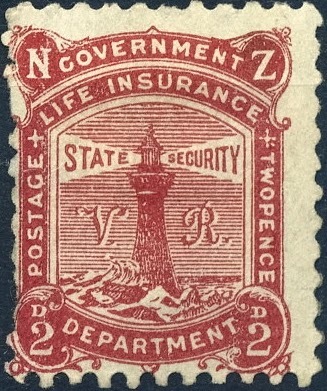 Real lighthouses, the symbol of the New Zealand Government Life Insurance Department, were again the subjects depicted on the stamps. ½c - Moeraki Point. 2½c - Puysegur Point. 3c - Baring Head. 4c - Cape Egmont. 15c - Dog Island. Included in our post - 1969 Lighthouses - Centenary of Government Life. In 1976 two more values were added due to changes in postal rates. 1981 Government Life Insurance Lighthouses. The final issue of lighthouses went back to a stylised design featuring bright colours and six values. 3c - Blue and Mauve. 10c - Purple and Red. 20c - Pink and Yellow. 30c - Mauve and Light Blue. 40c - Orange and Yellow. 50c - Turquoise Blue and Green. 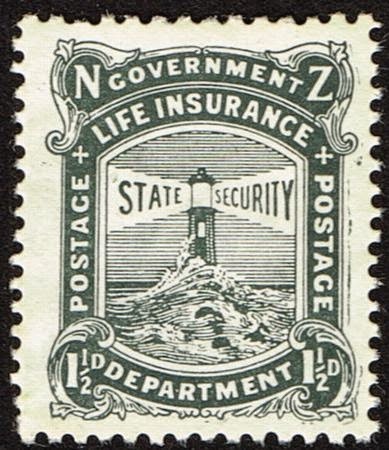 This would prove to be the final stamps issued by the Government Life Office as their postage stamps were discontinued in 1987 when Government Life Insurance became Tower Corporation. Lastly, I'm looking to fill in my collection, particularly with a couple early covers but also with a few of the varieties. To that end I'm including my email address (oregonhart@charter.net) so that anyone reading this might send me suggestions of where I might find these. To date, Kadine Stamps has been my best, reasonably priced option and Mowbray's is too expensive for my budget. I'm still searching for a good looking early cover with a 2nd Series (No VR) usage. 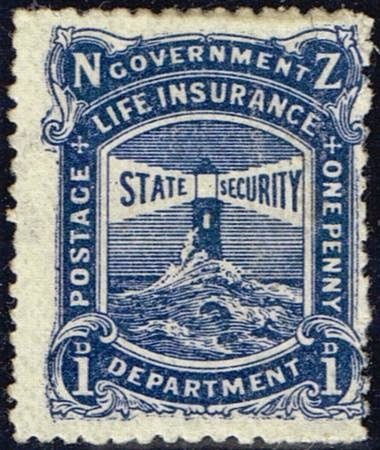 I've also decided I'd like to find a stamped cover showing use by a Government Life Insurance Office during the 1907-13 period. Presumably this would have an Official stamp but even regular postage would be interesting. I agree with you in that I would use Completestamp Company for a cover like that.